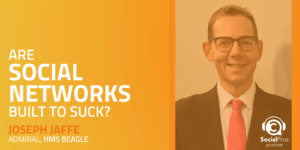 Phil M Jones, President and CEO of Philmjones International, joins the Social Pros Podcast to discuss ways to create more successful opportunities through conversation. There’s a lot of talk about the “human element” when it comes to marketing. Be it content, social, or direct product advertising, consumers are looking for humanity in the businesses with which they interact. Unfortunately, many still approach marketing as though it were a baiting game. Set up the product, make it look good, and show off whatever characteristics make it desirable. If your product is what consumers are looking for, they should come running! While this may prove effective to a degree, there is a whole world of people out there who might not even know that they want or need your product. This is why marketing through conversation is such an effective tool. It doesn’t even have to be face to face, but by approaching your content, social, or any manner of marketing through the lense of creating a conversation with your customer, you can engage with them on a human level and build opportunities for your product to meet their needs. Remember what industry you’re in! Rather than sales business or social business, you’re in the people business. It’s all about helping people achieve, not pushing a product. According to Phil, the greatest marketer on the planet right now is Ed Sheeran! After seeing an incredible performance when Sheeran was only 17 and witnessing the way he captured the crowd and built a fan base, Phil would love to chat with him a bit about his marketing genius. Jay Baer: He guys, it's Jay Baer, founder of Convince and Convert. This is another episode of Social Pros, t he podcast for real people doing real work in social media. Joined as always by my cohost, Mr. Adam Brown, my special Texas friend, the executive strategist for Salesforce Marketing Cloud. Man, what a show this week, I learned a lot. Adam Brown: I did, and I tell you these two books from Phil M. Jones, Exactly What to Say and Exactly How to Sell are small in stature, but the density of information in here is nothing short of phenomenal. I read both of them Jay, as I say in the show, on a flight back last night from San Francisco. The number of notes that were created from these books and the number of ideas spinning around my head was nothing short of phenomenal. It's just some great stuff and Phil is such a charismatic speaker and really owns the content. Jay Baer: Yes, he is really something else. He was extraordinarily modest about his background on the show itself, but he was named the greatest sales trainer in the entire United Kingdom before he was 40 years old, before the age of 40. He is really something else, and look, you might think well this show's not really about social media, it's about sales. Yes, but trust me, it's about social media as well. You are going to get a ton out of this conversation with Phil M. Jones and really cannot recommend his books highly enough. They both came out just in the last few months, super duper useful regardless of what your job is as we talked about in the show. Before we get into it just a quick reminder of the sponsors here on the show. We wouldn't be here without our fantastic sponsors. Obviously Salesforce Marketing Cloud who have the eternal wisdom to employ Mr. Adam Brown. Social is more important than ever for B2B marketers, yet some B2B folks have kind of a hard time figuring it out. There's a new guide from Salesforce called The Complete Guide to Social Media for B2B Marketers. It reveals the best types of content you should using in each segment of your social media empire, LinkedIn, Facebook, Pinterest, SnapChat. It talks about advanced social metrics, listening, engagement strategies, it's solid. Check it out at bitly/b2bsocialguide. That's bitly/b2bsocialguide and you can download it for free right now, that's all lower case. New sponsor on the show this week, our friends at Brandwatch. 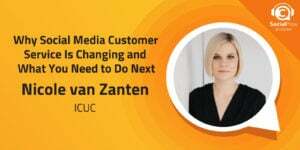 If you listen to Social Pro, the Social Pros podcast, you know that there's thousands and thousands of posts and images shared online every second, there's never been more social data available, we're swimming in data, and Brandwatch helps thousands of brands and agencies make sense of that data. 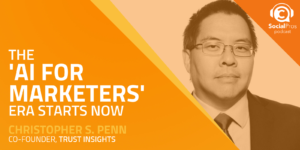 You get analyst level insights at the click of a button, you can find the right influencers and optimize your campaigns in real time, and you can prove your marketing ROI with data powered competitor benchmarking, which is super slick, immediate crisis alerts, hopefully you never need that, and add analysis that helps you convert. Make the most out of your marketing, go to Brandwatch.com/socialpros, Brandwatch.com/socialpros and see how Brandwatch software will help you keep a pulse on your customers, your campaigns, and your competitors. The show this week also brought to you by our pals at HYP3R, the location based social media marketing and listening platform that is blowing up. They are dominating in the world of geosocial local social data. You draw a circle around the location, it feeds you all the social content being published inside that location. Amazing for crisis response, amazing for analysis, amazing for guest engagement. They're being used by Marriott, by Norwegian Cruise Lines, HardRock, 24 Hour Fitness, anybody that has a series of locations is thinking hard about using HYP3R and rightfully so, they're genius guys. Go to HYP3R.com/socialpros to learn more about it and you should. H-Y-P, the number 3, R dot com. H-Y-P, the number 3, R dot com/socialpros and learn more about how to make location the heart of your marketing. 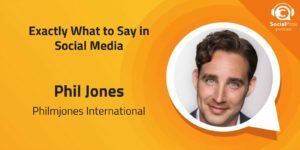 Thanks again to our sponsors, let's here now from Phil M. Jones on this weeks Social Pros podcast. Phil M. Jones, the M stands for magnificent, is our guest this week on Social Pros. Spectacular sales trainer, keynote speaker, man about town, fantastic human being, and author of not just one but two new books. The first Exactly What to Say: The Magic Words for Influence and Impact, and the companion book Exactly How to Sell. Phil, welcome to Social Pros. Phil M. Jones: Great to be here, thanks for having me on the show. Jay Baer: Now your book Exactly What to Say is a runaway best seller, you're selling all kinds of books. One of the reasons I think that's true is that it is so approachable and so valid in anybody's life. It doesn't matter really what your job is or your company is or your station in life, everybody needs to know how to communicate better. Do you feel like, in this sort of social media era where people are sending emojis instead of sentences and are tweeting instead of having conversations, that knowing exactly what to say is more important than ever? Phil M. Jones: I think the short answer to that question is yes, is more important than ever as it's always been a 9.6 out of 10 as a minimum. Yes, it's probably like a 9.64 I'd say right now in terms of importance. Yes people are communicating differently, in other ways, but what won't ever go out of fashion is the importance of conversation and the importance of getting to know people and the importance of the other person feeling like they're being hurt. Jay Baer: The book is structured with a series of magic words that you can use in different situations to be able to impact your audience, your community, do things different, better, more awesome. One of the things that I loved in the book was the magic word, it was really a phrase, if I can will you? Can you talk about that one a little bit, I love that one. Phil M. Jones: Yes, I mean what we're talking about is we're talking about being able to influence other people. To understand the power of influence we have to understand the word motivation, a word that gets thrown around a lot like it's confetti, yet still very few people know what it means. The true derivative of the word motivation is first part comes from the Latin word motarvis, second part the word comes from the word that we now know as action. Another word for motive would be a reason. If somebody's to take action they're going to move or they're going to do something. The real meaning of the word motivation is a reason to move. Now we all know that in real world scenarios if I'm going to move you're going to move too right? Nobody wants to feel like they got a bum deal in anything, they want to feel like some sweat equity's being played out here and that if I'm going to dance you're going to dance too. We get safety in numbers. When somebody asks you to move or somebody asks you to do anything outside of your standard terms and conditions, then what you can do is respond with a conditional response, which is if I can do that then would you do this? We're always looking to be able to make this compromise or this ongoing scenario to say, "Well hold on, we're all going to play well and we're going to play nice together and then everybody wins." It means that what happens is at the end of the agreement to an if I can will you, both parties feel like they gave a little and both people like they come away from this thinking, "Hey, I got a little more than I bargained for." Jay Baer: It seems to me like that's a very useful technique when you're using social media for selling, and obviously the field of "social selling" is in rapid increase. We've had lots of conversations here on the Social Pros podcast about social selling and professional sales people in a variety of industries using Twitter, LinkedIn, Facebook, Instagram, even Pinterest, SnapChat to interact with prospects in a way that sort of falls outside the regular "sales script". Do you feel like these magic words can be used in that context for sales people? Phil M. Jones: I think they can be used in all kinds of different people. What we do need to remember though is that what the majority of people want to do, particularly as marketers, is they wonder what's the killer post, what's the one set of words that gets me from nowhere to somewhere, like in an instantaneous silver bullet type fashion? It's about as useful as saying, "What's that one line that I can use in the club that's going to get her to go home with me?" It's kind of like a fairy tale. People look often for things that are inappropriate on the first date or they want to get married with kids without having to go through all the bases. We need to think with our conversations that we've got to move from piece, to piece, to piece, to piece, to piece. Something that will never go out of fashion is the questions create conversations, conversations lead to relationships, relationships create opportunities, and opportunities lead to sales. What the book is is either questions or prefaces towards questions to mean that those questions start to open up more conversations. Those conversations make more relationships, those relationships create more opportunities, those opportunities lead to sales. When we're thinking about selling in a social capacity our goal should be starting of conversations. Conversations in predetermined frameworks or boundaries to allow us to be able to create opportunities in order for us to be able to sell. Not how do I post something, say something, or delivery something in a messenger form app to get somebody to buy something? It's going through all of the bases. Make sense? Adam Brown: I think it does make sense Phil and I enjoyed that one as well as all these last night. I was coming back from a customer meeting in San Francisco and I read your book Exactly What to Say on the plane and it was funny. I was going through the book and I read one of the phrases in the book and recognized it. I had actually used that yesterday in my customer meeting and it's one of my favorite ones, it's one that I use often times and here's where I want to get your thoughts on it. The phrase is just imagine, and here's why I love that phrase. Because it is impossible not to imagine something when someone says it. For example, if I say, "Just imagine that you are on a beach," you cannot not imagine that and I'm curious why does that phrase work like that? Why does our brain do what it does when we say that, because there are many times when people in a sales type of situation will tell you to do something and your brain will say no. Just imagine has a secret power, what is that? Phil M. Jones: Well you got to understand how the mind works in it's really simplest and purest of fashions. Think of it as a Rolodex of images. That's how memory works right is we have this catalog of images that we have created that allow us to be able to reference back scenarios. We don't remember the thing, we remember what we saw when we were doing the thing, which helps us remember the thing. The images are the things that are most important to us and this actually talks towards the power of many modern day social media platforms is the power of an image. In fact every decision that's ever been made has been made at least twice. I mean I wonder whether you've ever said to yourself the words I cannot see myself doing that. It's a literal thing. If you cannot see yourself doing something you're not likely to go ahead and go and do that thing, but once you've seen yourself doing that thing you become more likely to go ahead and go do it. We have to have seen ourselves doing something before we then be able to lead towards it. This was trained to us as children. As children we learned the power of our imagination. It was where we learned things best, we created paths of least resistance for us to be able to accept information in story form easily because they come to us in the form of images. Preface to a set of words that work for us as kids would have been once upon a time. We knew when an adult said to us once upon a time that they're about to tell us a story, it's going to be good, kick back, open up the picture viewer, let's start planting in some images that are going to feel great, take me on a ride. Can't say once upon a time to adults and expect it to lead to a positive business conversation. Yet what we can say is we can say just imagine and cannot help but see the thing that we're asking them to just imagine, because it's a pre-programmed belief that we have towards our subconscious. It's like a shortcut, so if you think about looking down to your keypad right now on your keyboard on your computer you'll know you have shortcuts to allow you to be able to do things easily. Just imagine is a set of words that opens the shortcut for somebody to say, "Please insert picture." Adam Brown: Phil another phrase that I love from Exactly What to Say that I think is much like just imagine in that our brains are kind of pre-programmed for it, is the phrase I bet you're a bit like me or I bet you're a lot like me because you can't imagine yourself in a situation without that. That's one that we oftentimes hear kind of in sales. I'm curious kind of how you've come across using that and if you see there's any application for using that sort of conversational style with social media content. Phil M. Jones: Yes, it's a great point and I think we have to understand some of the psychology behind it first of all, is that the majority of human beings hate conflict. We absolutely despise conflict. We'd rather agree with somebody we don't agree with for the sake of an easy life than we will find ourselves in a hot topic conversation. What we are looking to be able to do is to understand that selling is earning the right to make a recommendation, so that's what selling is. It's not embellishing a product or service so that the other person thinks it might be a good idea to buy it, it's earning the right to make a recommendation. What that means is we need to be able to gather evidence to be able to make those recommendations based on. What I bet you're a bit like me can do is it can get the other person, it can help you get just about anybody to agree to just about anything providing you're reasonable. Works even better with a stranger in a conversational setting than it does with somebody who knows you well. I could say to you Jay, "I bet you're a bit like me." You'd be like, "I'm nothing like you" because you're brave enough to know enough about our relationship to be able to front that up. In a setting where you're dealing with somebody who's less well known and perhaps just knows you from a distance, which is great in a social media setting, where what you've got is you've got maybe a situation where you've got clients who know you as a brand, or clients that know you as a person, and you say, "I bet you're just like me" or "I bet you're just like so and so" if you introduce a personality character into some of your marketing pieces. Then what you can allow people to be able to do is find agreement with the fact that now they have a pattern to follow. In a previous life of mine one of the things that I was challenged to do was to help people in the furniture industry overcome some of the challenges they had when introducing some of their key profit drivers into the business. One of the biggest things that drove more profit in the furniture industry than anything else was fabric protection on couches. Biggest objection as to why a customer wouldn't want fabric protection on the couch is they would say, "We're dead careful, we don't eat and drink on our furniture." I find that still a fascinating objection to come commonly because people say that salespeople are liars, my experience is customers aren't so good at telling the truth because clearly everybody eats and drinks on their furniture at some point in their life, everybody has a can of beer, a glass of wine, a TV dinner or something. Everybody does it, but a customer says, "I don't eat and drink on my furniture," I could never say, "Well of course you do, of course you do, everybody does." What I could say before I get to that objection, I could say, "I bet you're a bit like me, never find time to sit around the table as a family, more often than not it's a tray on your lap in front of the box," and everybody would agree. I bet you're a bit like me and more often than not you get in from work tired and it's coming straight to the fridge to open a can of beer. Yes, yes that's me. Sit down at the couch watch the sports. What that person can now not do is to say they do not eat and drink on their furniture. Where do you use that? You use it in social storytelling ahead of being able to make an ask toward somebody, to create a piece of agreeable evidence that you're going to use as an anchor to make your recommendation. I bet you're a bit like me, I bet you're a bit like Steve, I bet you're a bit like Gemma, I bet you're a bit like whoever, get them to be able to agree towards the fact through posting or conversation or messenger exchange or wherever it might be earns you the right to be able to make the recommendation you might want to look at this because we've created evidence to be worthy of the recommendation. Adam Brown: You're mentioning an example person like Steve is very apropos for my next question before Jay and I focus now on your next book. One of the phrases that you have in the book is one that Steve Jobs is so kind of personified and made genuine and that is the just one more thing. How many Apple product launches do we remember with Mr. Jobs ending with that? My question for you Phil is because of that, because of Steve Jobs use of that phrase and it's ubiquitous nature now associated with the last product of any Apple new product expo, has the phrase just one more thing lost any of it's gravitas or emphasis or influence? Phil M. Jones: What we need to think about all of these phrases is they work best in the moment. If what happens is you give yourself a decade or even three seconds to think about the power of these phrases you can find a million what if spots and maybes. It's the instantaneousness of their application that talks towards the subconscious brain that creates the reflex. One of the things that drives more people than anything else is the power of curiosity. You come up with a just one more thing moment, then what happens is you cannot help but think, "Well what is it?" The other stuff was great, is this better than great, worse than great, equally great, what is it? I got to come on in, and Steve Jobs might take claim for it but it's not Steve Jobs, it belongs to Columbo. That's who owns that phrase is it comes from the TV detective in the 80s. The would create Columbo moments that when somebody was being questioned towards their whereabouts, their whatsoever, what they're up to a certain period of time that would have either gotten their alibi or proved that they didn't do it in the crime scene, he'd finish his questioning, he'd look to leave the room, he'd come back and he'd say just one more thing. Their guard is dropped and he can ask a more killer question. It gives you the ability to be able to ask for more in a completely rejection free capacity where the other person their defense has dropped. What I encouraged lots and lots of people to do is to create Columbo moments. I mean just imagine where this could fit for many of your clients. Could it come in the form of an email auto responder on the back of a transaction? Hell yes. Could it come on the back of somebody deciding they've just completed a survey to say that you guys are awesome? Could it come in the form of even an automated response on the back of a web checkout? There are so many places that a just one more thing moment can exist and in the moment it will never stop being powerful. What may well happen after the fact is you think that was clever, but it comes to you like three minutes later and that you're pleased that it was clever. You just can't help but applaud the brilliance like we do with Steve Jobs copying Columbo. Adam Brown: Thanks for reminding us of the Columbo moment, you're exactly right having watched that show when I was a little kid. For those of you who are not familiar with Columbo you need to go Wikipedia it and see that that moment, as Phil said, that just one more thing moment was that [inaudible 00:19:02], that was the cliffhanger between act two and act three of every very formulaic, procedural detective show back in the 70s and 80s. Jay Baer: Before Adam jumps in with a question about Phil's other new book, he's writing them in batches, it's insane. I wanted to remind Social Pros listeners that Phil's book Exactly What to Say was named the most useful Non-Obvious book by a friend of the show Rohit Bhargava, who was on in January talking about his Non-Obvious trends of the year. Rohit's a very, very smart man so if he says it's the most useful book of 2017 you can take that to the bank ladies and gentleman. I couldn't agree more, Exactly What to Say is a book that everybody should read regardless of job, regardless of circumstance. One of the things that's amazing about this book is that it is a slight book, it's easy to get through, it's not long at all. Phil, one of the things that you did to sort of promote the book, which was genius, was a campaign that you launched on Facebook to demonstrate to people, to prove to them that in fact the book could be consumed in under an hour. Can you talk about that a little bit? Phil M. Jones: Yes yes, it was super fun actually. One of the things I learned about the whole book game is that people in business are great at buying books, they're just not so good at reading them. I figured if I could distill down some information into a piece that could be read cover to cover within 60 minutes I'd be onto something, and that's where we planned to be at a go with Exactly What to Say is I wanted a 60 minute read, I wanted that if you're on a flight, regardless of how long that flight was then what we'd be allowing ourselves to be able to do is to get through that book in a single flight, that was the goal. I put it all out there that it was going to be an hour and then I'm thinking to myself well how do I prove it? Now we could wait until Audio Book comes out, but on the day of release I sat on my couch with a pile of books around me from where my author copies had arrived, and I decided to run via Facebook Live. I did a number of teaser pieces through some of the groups that I've built up through the years and said, "Here's what's happening to give everybody first access to the book I'm going to sit and I'm going to do a live reading of my book." Not just a live reading of the excerpt of the book, a live reading of the entire book from the cover to the testimonials to everything can get through it. We did it in like an hour and seven minutes with all of the fat of the acknowledgements and everything else alongside it. It was super fun because it got shared, it got pushed around into a load of other groups. It showed a level of initiative that this is something that was different here. I think was probably one of the key factors that went into the early success of the book. Now did we get tens of thousands of people viewing the video? No. Did we get hundreds? Yes. Did we get great comments, did people see it as being something that was different? Yes. Did it get talked about? Yes. What happened was is we created something that was remarkable, something that was worth talking about. I'm a big believer of things like books, there's only one thing that sells books, it's that somebody else told you to read it. What I did is I created a moment that other people could go on to be able to talk about and I think Jay you might have something to say about talk triggers, but maybe that's another time. Jay Baer: Yes, some day when that book is available then we'll compare notes, thank you for the plug. My new book Talk Triggers with Daniel Lemin out October 2nd. You'll be hearing more about it here on the Social Pros podcast. Adam Brown: Both books that I'm either anticipating or loving. I tell you Phil, there's one thing about your book Exactly What to Say that should be changed, and that is it should include an exacto blade because what I'm finding myself doing is ripping every single one of these pages out and sticking them somewhere in my office, on my bathroom mirror, that sort of thing. That's the type of book it is. Phil M. Jones: I tell you what I have done and I'll say to anybody listening in right now if they tweet me or if they find me afterwards. I'll make sure they can get one of these for the hand, is you saying that I wanted to do something that we could buy an offline marketing with online marketing with this very book launch. I produced the whole book on a single postcard. I took every set of the magic words and created a beautiful infographic about it, and it now sits as an insert in any of the physical books that we're running towards events. One of the things that I've put on the back of the postcard and I'm just going to grab one from my office right now and read it across to you guys because I think people might like this idea as to where they can join up online and offline stuff. Adam Brown: No I think that's great and we can definitely put some links to any of those types of things in the show notes at SocialPros.com. Phil M. Jones: Yes, so I just wrote a little thank you note on the back of the postcard. This was something that somebody could stick by the side of their desk to have as a reminder of all the word choices. I wrote a thank you note on the back and it reads as this: Hi there, I created this book to be a quick and simple tool to help you to make even more of your conversations count and grow the confidence where it matters. This little postcard gives you some quick visual clues and reminds you the key magic words in the book and can provide you just the prompt you need to help you in the moments where it really matters. If you enjoy the book and take value from it then there are a few things that you could do that make a huge difference to authors. I was hoping you could help me with a favor or two, obviously fun little plug from the book. Take a moment to leave a positive review on Amazon.com, share a photo of you and the book on social media including the hashtag Exactly What to Say, introduce the book to others in your team in your business, buy a copy as a gift for somebody else, include an editorial review on your web, your blog site, send me a note on social media with your top takeaways. There's a big bold ask that sits on the postcard but I think it comes from distilling down the content even further so and providing an additional gift and it's worked. It's been fun. We're one of the most reviewed books on Amazon in the short period of time and people are talking about it. I think that's what many people in the world of social seem to forget is the goal is for us to be able to start more conversations, continue more conversations, and close more conversations. Not to push more products. Adam Brown: I think that's a perfect segue into us talking about your other book Phil, Exactly How to Sell, which the subtitle is The Sales Guide for Non-Sales Professionals because really that is what all of us, as social pros, truly I think aspire to be. I love how these two books complement each other. Exactly What to Say is a more tactical book, you say that in your introduction. Exactly How to Sell is a little bit more strategic. What I love about Exactly How to Sell is the idea that we are all salespeople. We may not think of ourselves as a salesperson but whether we're a marketer coming up with a new compelling story for a customer pitch like I had yesterday, or even an employee trying to make a case for a raise or promotion. We're all salespeople. I would love to hear you talk a little bit more about that and how you, it sounds like, even in how you market Exactly What to Say, you are a non-consummate salesperson doing some amazing and interesting things in selling your book. Phil M. Jones: Yes, I think firstly we kind of get to this early on in the book is to try and understand the difference between sales and marketing. What marketeers do is they try to get bees around the honeypot. They say the honey's so sweet please come turn up. Now that's a great thing. The challenge is though that you can't control who all those bees are, and the majority of people I bump into in business in some way are dealing with a customer that they wish they didn't have. Somebody that chose them as opposed to you choosing them. If you think about right now any of the customers that you've had through the years that have been a pain, they're not the ones that you've strategically run out to hunt down to say, "I want to spend the rest of my days with you." What they are is somebody who decided that they wanted to be one of your customers one day, not somebody you decided you'd like to be one of your customers. What salespeople do by alternative is they choose their customers. Instead of trying to play an attraction game we go out and we have a farming and gathering phase. We do have the right to choose our customers. I think it's too easy to forget that right. What I'd encourage more people to do is to say, "Well who are the people that I help and what are the problems that I solve for them?" And, "Do I have a list of people that fit that description that are big enough?" If people haven't got enough customers right now the first thing I ask them to do is to define exactly what it is that they're looking for. They know that what they have is personas and that they have types of customers that they're looking for, but I try to make it as precise as possible. Let's get a specific list of missing people, and I call it missing people. Then I ask them to think about what that missing person poster looks like, and then I ask them to think about what is the size of the list that they would need to make them confident that they'd get the conversion results they're looking for. What marketeers do is they look for lots of new customers. What salespeople look for is 22 new customers, or 12, or 36, or 94, or 112. They can choose that precise number and they can choose who they are. I think that's the first big delineation between those two. Then when it comes to being great salespeople we need to know how to open conversations. It's the biggest problem though almost every salesperson has is they can wait for it to happen as opposed to make it happen. They don't know how to be able to go and open up those doors, don't know how to go and open up more conversations. One of the next things that we do in the book is I teach people how to build a giant great big list full of potential customers, a list full of people with purpose and then teach them the precise sets of words that they can use to open those doors more effectively, to have more meaningful conversations with those customers. Adam Brown: Do you think that's one of the challenges that we are faced with today with employee social advocacy, this of course is all the rage where companies ask their employees to share company information on Twitter or Facebook or LinkedIn or Instagram in some cases, and sometimes it works but in a lot of cases it doesn't work very well. Is it because companies are sort of asking employees to sell instead of having conversations and ask questions that just are authentic and interesting? Phil M. Jones: Yes, I think it is. I think it's a good idea badly executed. Now I have a simple kind of strategy that has been my success principles my whole entire career to date and I've been in this game now since I was 14 so quite some time. The success is achieved by doing the basics to a high standard consistently. What often happens is people come up with a quick idea and then execute it badly and wonder why it doesn't work. Social advocacy is a great idea but exactly what do you want those people to say? How do you want them to go about it in an authentic way? What is the action that you're looking for them to actually be able to take? An example of which that I see regularly right now and I hope I'm not speaking out of turn with it, but it's a platform that is being massively used by a lot of people and it's the one of Thunderclap. Adam Brown: Yes, very common for book launches. Phil M. Jones: Yes, now I hate it, and the reason that I hate it is what it does is that you are reaching out towards your network to gain advocacy to share a message about your product or service. It sounds great right, but it's the easiest thing in the world to buy into. Jay does a book launch, launches a Thunderclap, Phil comes on board says, "I'll support Jay." Got a way from supporting Jay really easily, I just support the Thunderclap. Now you just took your ask of me being able to do something powerful for you, the favor that might have been being asked for you, and turned it into a generic monotonous tweet that sounds like its selling. Adam Brown: When everybody is tweeting the exact same thing at the exact same time it feels a little artificial. I've certainly participated in several of them, but when I launched my last book I didn't do one for the same reason. I thought well this is going to feel bogus to people. Phil M. Jones: That's the same thing that happens with the advocacy asks. We put an ask out to our employees saying will you support the brand mission, will you support what it is that we're trying to do? Everybody says yes but does it badly, but now what we've done is we took our one shot of asking somebody to help us, and because we didn't educate them on the way to help us with authenticity and truth, what ends up happening is that we have a watered down version that potentially has an adverse effect as opposed to a positive one. I used Thunderclap with an extreme example just to prove the point, but I think what we really want to be looking to do is to teach more of our people to have more meaningful, positive conversations about their experience of doing business with the brand. Now an employee can buy an experience from a brand in the same way that a consumer can buy an experience with a brand. They've just got to learn how to talk about it and learn what to say to be able to create moments. Adam Brown: Well and to some degree it's not even learning about how to talk, it's being empowered to talk about it. Phil M. Jones: Yes, and empowered with some skill attached to it though. I mean I've heard lots of people feel empowered to talk about their workplace and they do it in the pub or at the dinner table or in a bar and I'd rather they didn't. They feel remarkably empowered, but what they're doing is they're being sabotaging of their brand. Brands are obviously quite often scared of that thought so we lock that whole thing down. There is an element of education here is what do we want them to say, how do we want them to go about it, what is the procedures? I think social media policy was something that often is driven through fear on many of those policy documents in many organizations. It might need to be revisited. Lots of companies sit there and go, "We've got our social media policy. We put it into place in 2012, we were ahead of the game." All that stuff might need to be revisited if advocacy is the goal saying how do we empower with education, with boundaries to allow people to actually be able to have meaningful, powerful conversations about the great work that we're doing, to build remarkable reputation. 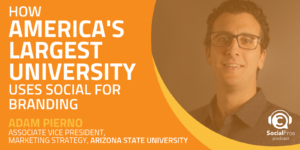 Adam Brown: Many listeners of this show are social media professions, befitting the title of the program, and they in some cases want to get promoted, they want to transcend social media and get a job running a larger swath of the marketing department. Let me ask you this Phil before I get to the last two questions that we ask everybody, what should they say? How should they sell themselves? If you're trying to get a promotion, you're saying, "Look, I'm really good at this one piece of the organization. I can do more." What's the playbook for those folks? Phil M. Jones: We're back to the same point we made earlier about the power of questions. What you often need is a window of opportunity where you've got somebody's undivided attention for a short period of time to float an idea that might make their job easier, so that's what we're looking to try to do is to prove to our boss, the leader, the decision maker in that capacity that there's an idea here that makes their train set run faster. The missing piece is how do I get that window? There's a couple of ways that we can create that window. Much of them I talked about in Exactly What to Say, but let me lift a couple of big ones. First one is if I were to ask you guys here on the show right now to decide whether you're open minded and say you're open minded, what would the answer typically be? Jay Baer: I think everybody says yes even if they're not. Phil M. Jones: Well yes because what's the alternative? The alternative isn't even close minded, the alternative is idiot. That's what the choices is, pick open minded or pick idiot. What we can do is we can create a window of opportunity in somebody's mind by asking how open minded question would you be. How open minded would you be to giving me 15 minutes where I can share some ideas about some of the more things that we can do in the marketing department to drive better results for you and your success plans? How open minded would you be to perhaps me taking on some further projects, taking on additional responsibility helping me to progress in my career? We can take a how open minded would you fashion. We could also approach it from another way. We can throw down a challenge. Here's what we can do is we can put the onus back in the [inaudible 00:34:15], so the boss to be able to get them to be able to come up with a roadmap. Hey what would need to happen for you to take or feel empowered to give me more responsibility and for me to get the next step on the ladder? What would need to happen for that to be true? What I've done is I've created a question there to get the other person to be able to push back where the gaps might be in my existing workload. I could also produce a way of being able to insert an idea to somebody completely rejection free by being able to position it to the left or the right of them. 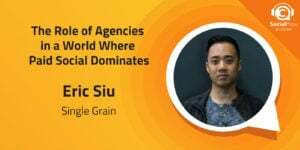 I could say, "Hey I'm not sure if it's for you but I got some really great ideas about some things that could be done in some of the other departments, it could amplify what it is that we're doing here on social media and work for the greater good." I could then say, "Well when would be a good time for us to sit down and have a conversation about this?" Not is there a good time, when would be a good time? See that simple change of words says that there's definitely going to be a good time. What we need to be doing is leading the conversation, leading the charge as opposed to waiting for somebody to come and save us, and remember that what we're looking to try and do is to be able to romance ourselves towards the outcome we're looking for. It's not sit there frustrated, and the worst thing that happens to many people in employed roles is they spend all their time selling to their loved one, their other half, and their friend group why they should get the promotion and they're having the right conversation with the wrong person. Jay Baer: You heard it here on Social Pros ladies and gentleman. If you want to get promoted you just call Phil M. Jones, he'll give you the exact words to say. Seriously grab the books, they're both incredible, it will make you a better professional regardless of your role. Exactly What to Say and Exactly How to Sell. 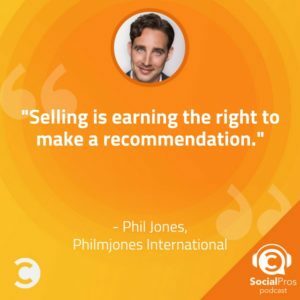 Our guest Phil M. Jones on this episode of Social Pros. This is one, because Phil is so specific and precise about his language as he should be [inaudible 00:35:52] the book, this is one we're going to want to read the transcript. Go to SocialPros.com, spend some time on the transcript you will be better for it. Of course every episode of the show, all 312 episodes are all there at SocialPros.com. Phil, I'm going to ask you the two questions that we've asked every guest here since we started the show eight years ago. Question number one, what one tip would you give somebody who's looking to become a social pro? Phil M. Jones: The one tip is to remember what industry that they're in. The industry that they're in isn't the social media business or becoming a social pro or becoming a marketeer, the industry they're in is the people business. I think if they can consciously keep sight of that on an everyday basis then it will help them understand that what they're not doing is selling widgets or whatnot, they're helping people achieve X. I'll build on that in one great way is that everybody needs to know the answer to key questions. First question is who are the people that you serve, second question is what are the problems that you fix for them? If you can know the answer to those two questions you can probably achieve a lot more success in all of your conversations. Jay Baer: That's one of the best answers to that question we've ever had. So well done, thank you Phil. Last question with Phil Magnificent Jones, author of Exactly What to Say, Exactly How to Sell, also if you get a chance to see Phil speak I highly recommend you do that, he is exceptional. Phil, if you could do a Skype video call with any living person who would it be and why? Phil M. Jones: So easy for me to answer. The greatest living marketer that exists on the planet right now but still nobody has appreciated the ability of his genius as a marketer and it's the musician Ed Sheeran. If you follow his career from the very, very beginning and I was fortunate enough to see him perform when he was about 17 years of age and the lights went out in the bar that he was performing to about 160 people, the gig looked like it was about to be canceled. He pulled a wooden table out into the middle of the dance floor, stood on stage with a guitar, and rocked the show for the next 90 minutes. Then collected the business cards and slips of paper from every single person in the room to be able to add them to his fan base and his mailing list and he continued to do this at same show, after show, after show, after show for years. If you follow some of the genius of what that guy's done to be able to try to put him into a situation where he had, I think last year somewhere like 25 of the top 40 tracks in the whole of the music industry with songs he either produced, collaborated on, or written, the kids got some game when it comes to building tribe in a way that nobody else has done and it's somebody that I follow as a marketer and as a human being that I'd love to just be able to pick his brain for 20 minutes or so. Jay Baer: I love it, that is a great answer. We've never had that one on this show before, thank you so much for bringing that to light. We'll make sure to link that up in the show notes as well. Phil thank you so much for sharing your expertise with our community on the Social Pros podcast, it is always illuminating and delightful to interact with you my friend. Phil M. Jones: Thank you for inviting me on the show. Huge pleasure, keep up the great work gents. Jay Baer: Thanks, we'll do it again. On behalf of Adam Brown from Salesforce Marketing Cloud I'm Jay Baer, founder of Convince and Convert, and this has been Social Pros. Back next week with another fantastic guest. We will see you then.